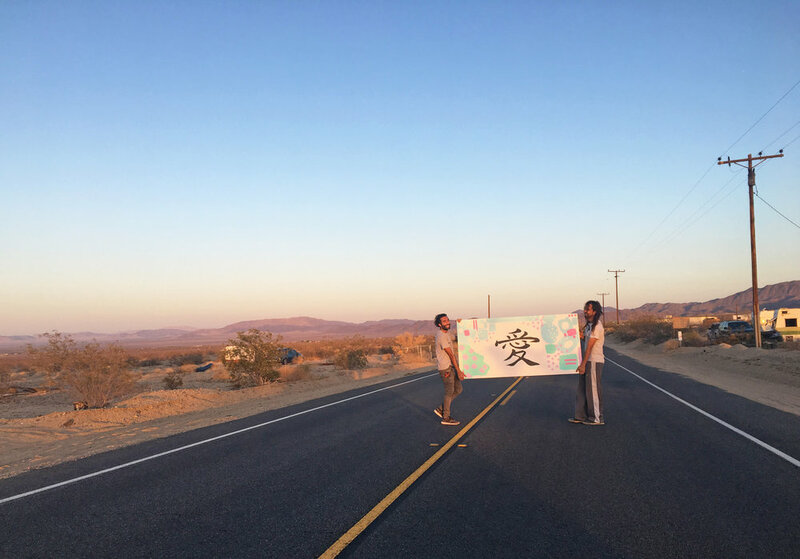 Love Signs are a roadside message of love. Each sign says love in a different language. The Love Signs are listed on Tripadvisor, Google Maps, and Atlas Obscura. Please leave us a review. A new guestbook has been installed on the “Love” sign. Please sign it if you visit. 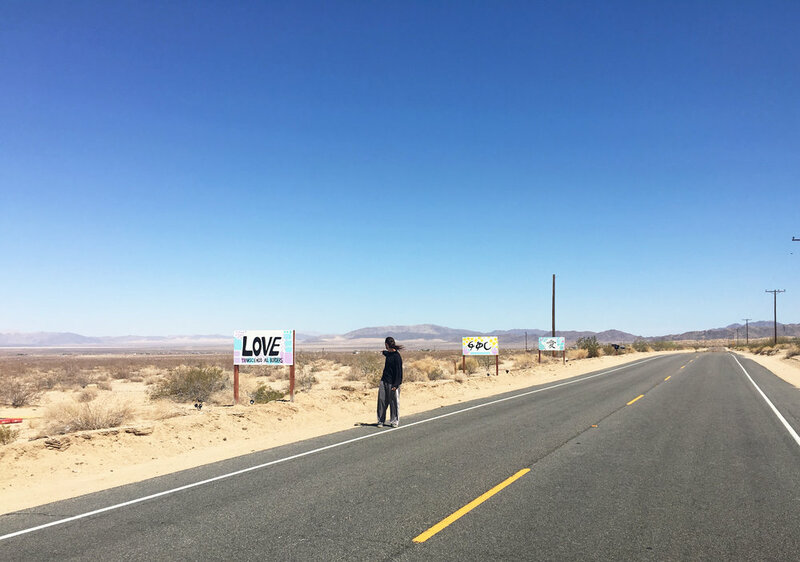 Heading East on Highway 62 from Twentynine Palms towards Wonder Valley, you'll see the Love Signs on the left hand side of the road. See the signs on Google Maps. Pictured with Jose Deangulo. Love Signs are the culmination of over five months of planning. Installation took place in June 2018. The installation process took one week. Jacob Rafati painting the stencil for the word Love. 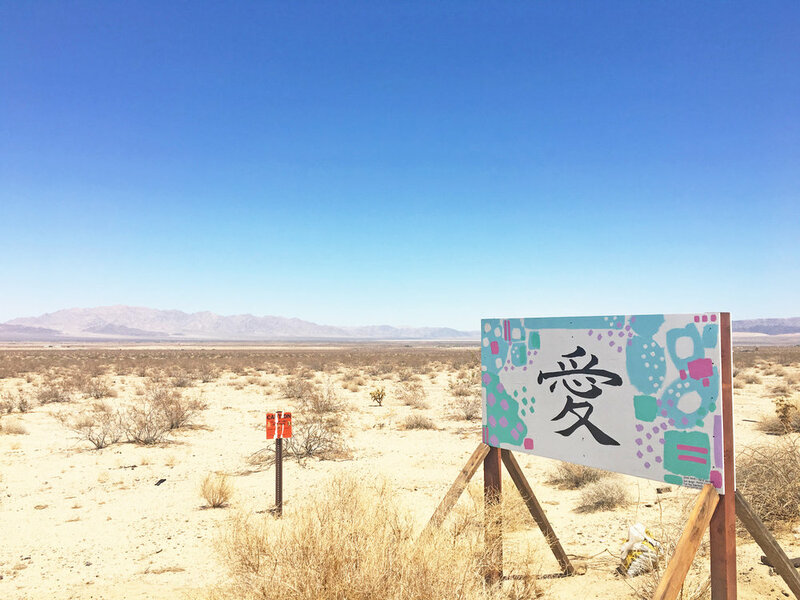 Katie Williams priming some wood on Highway 62, the main road through Joshua Tree, Twentynine Palms and Wonder Valley. Jacob Rafati and Jose Deangulo transporting a sign to the installation site. Love Signs was envisioned by Jacob Rafati, originally from Tabriz, Iran and Katie Williams, originally from East Tennessee. Jacob and Katie are multimedia artists living California. Throughout the process, Katie and Jacob were fortunate to meet and collaborate with a variety of talented artists to make this vision a reality. 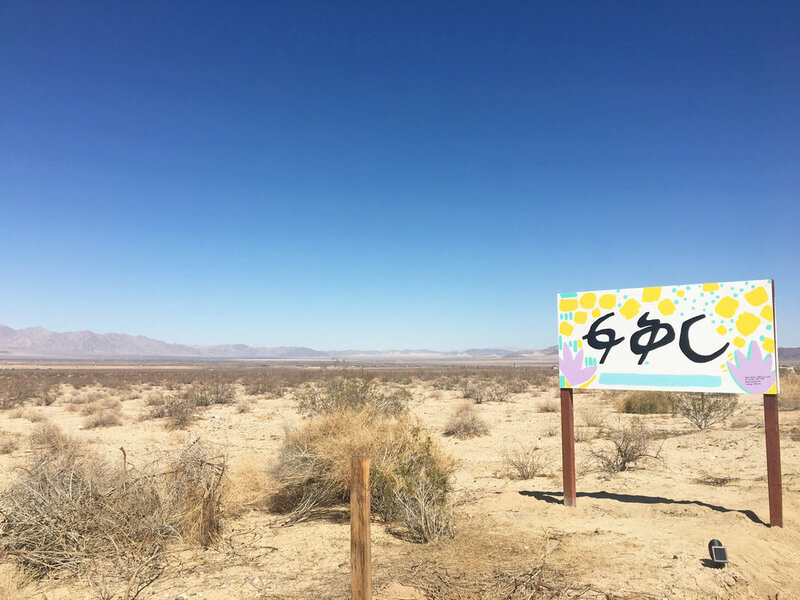 Wonder Valley local residents Cassandra Lopez and Jose Deangulo helped tremendously to create and install the signs on their property on Highway 62. This project wouldn't have been possible without their support. Are you an artist? We are looking for collaborators and text designers. Please reach out. Let us know what you think. We're open to your feedback. Constructive criticism helps us to better the project. Donate to our GoFundMe to help with the cost of materials. We're so grateful to have been selected as an Awesome Foundation San Francisco grant recipient, which paid for the materials for this project. We also value and appreciate the feedback we have received from other artists, and scholars. Please continue to engage with us in critical discourse to move this project along. We appreciate your time and energy.